Just shy of two years ago, we decided to move from the trail mecca of Golden, Colo. (complete with across-the-street trail access) to Denver. While I loved having trail access out my front door, I found climbing in a car to go anywhere exhausting and tough on my carbon consciousness. We found a darling, yet woefully dated bungalow in West Highland that offered a #ridemoredriveless daily lifestyle, shaved my daily commute to 15 minutes by bicycle, and served up plenty of renovation projects to keep us busy. Our first year was hard – city life was dramatically different than rural Golden. The parking hassles, the noise, pavement everywhere…despite my best intentions to ride everywhere, I found the adjustment to city life difficult and old car habits were hard to break. Add to that my work and travel schedule kept me off the saddle and behind a desk more than ever…the days of carefree riding, simply opening my garage door to roll out on canyon roads or dirt felt foreign and beyond distant. Interestingly, I found a daily dose of sanity by reaching for my bike to make that 15-minute commute to work. I chose between bikes lanes, bike paths and neighborhoods roads to pedal out the day before and behind me. And despite traveling upwards of three weeks a month, I strapped on my helmet to commute 96 times. The simplicity of grabbing my bike to go to work, dinner or the grocery store is indescribable. 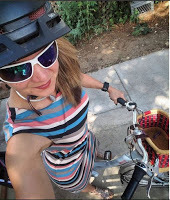 My commute became my joy and the system of bike paths around Denver, my new stomping grounds. I finally invested in a cruiser bike, complete with rechargeable lights, a rear wheel lock, fenders, a basket and a grocery getter pannier. The neighborhood was an old friend now, and I knew it’s streets. It wasn’t the foothills of Golden, but it was pretty awesome. When my second spring rolled around, the quiet streets of West Highland blossomed into an entirely new neighborhood. My morning commutes were fragrant with spring flowers, and train of commuters on my route home brought familiar comfort when my days ran into darkness. I was now going days without moving my car. I added Lyft, walking and begging rides from hubby to my commute mix. Even bigger this year, my hubby and I took our first cycling vacation. Rather than rent a car, we explored Norway by bike for eight days. The experience of riding our bikes in a foreign country, along quiet roads and boarding ferries to cross a fjord was indescribable. Sitting in a fruit stand to have lunch before pedaling to the next town...pure joy. I also found peace with merging my professional job + commuting. I don’t have a shower at work, so the struggle with hair + sweat management + outfit selection is real. I embraced the side ponytail to make my new post-helmet hair manageable and slowed my pace to avoid glistening. 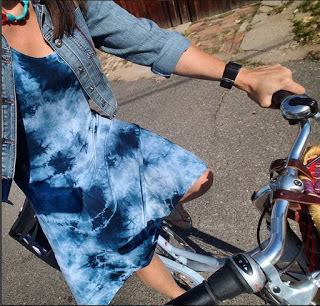 I tested my “professional” wardrobe and found that most everything was bike-friendliness for the time/distance required for my commute. Despite my crazy travel schedule, I managed 92 commutes and 331 rather stylish miles by bike, if I do say so! If 2017 taught me anything, it’s that a commuter mindset happens in small, every day actions, not just the bold ones. I'm so grateful for my commuter team..this team is comprised of women from all backgrounds...medical, executives, lawyers, nonprofit leaders, small business owners and mathematicians. 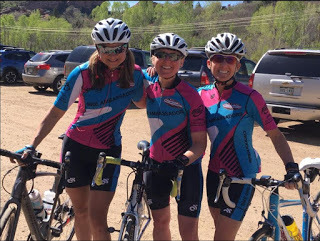 Despite their full schedules, these ladies stay committed to the bike commuter lifestyles they want to lead and remind me of the possibilities, joy and experiences to be had by bike. It would be very hard to trade in this lifestyle, given the freedom and hours of car-free life I’ve taken back. So here's to 2018! I'm ready for the adventures you have in store!